Make this easy Restaurant Style Pineapple Raita at home using my simple recipe and see yourself falling in love with the dish all over again. Here is how to make Pineapple Raita Recipe. Summers are upon us and I am always looking to make refreshing dishes that cools down the body. This Restaurant Style Pineapple Raita is everyone’s favourite and if I tell you, it’s addictive, it’s an understatement. Just like the popular Boondi Raita, this raita is also a crown pleaser. Chunks of fresh pineapple cooked in a sugar syrup and then mixed with fresh homemade curd and a very few spices gives this raita a unique flavour and makes it a perfect side dish to serve with any Indian meal. 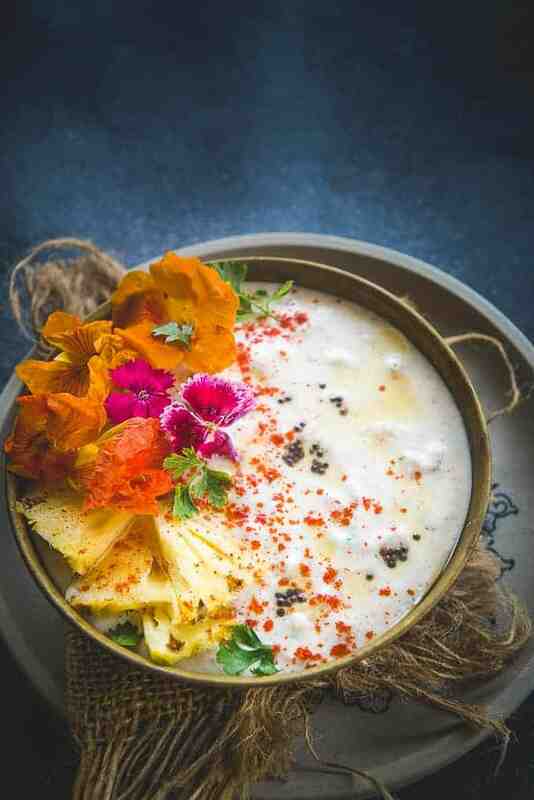 Unlike the raita recipes where uncooked pineapple chunks are added in the curd, this unique recipe will change your notion about this raita. Trust me and make it for yourself. Pineapple Raita is a dish where yogurt is mixed with a few spices and pineapple chunks. It is a very common Indian accompaniment or a side dish and is served in most Indian restaurants. How to make Pineapple Raita? You might have known to make this raita by chopping the pineapple, adding it in curd along with spices. But I am here with a fire cracker of a recipe and you will never go back to the previous method ever. In my recipe, the pineapple chunks and some of the pulp is cooked with sugar and it is then added in whisked curd along with roasted cumin powder, red chilli powder, black salt and fresh coriander. Why my Pineapple Raita turns bitter? 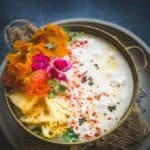 Pineapple Raita may get bitter after sometime because it contains an enzyme called bromelain which reacts with dairy products. This can be avoided by cooking the pineapple and my recipe exactly do that. Another way to make sure the raita doesn’t turn bitter is to grill the pineapple before adding it in the curd. Canned pineapple also doesn’t turn bitter as they are cooked before canning but I really do not encourage the use of canned pineapple as their taste is very different from the fresh ones and that can result in a very unappetising raita. Heat water in a pan. Add sugar and pineapple pulp and cook for 3-4 minutes. Add pineapple cubes and cook for another 3-4 minutes. Pass the curd through a strainer so that it becomes smooth. Add the cooled pineapple mixture in the curd. Add roasted cumin powder, black salt, red chilli powder and normal salt and mix well. Garnish with fresh coriander and serve chilled.